David McInerney will be sidelined for up to a month with a back injury. David McInerney was man of the match against Limerick but will miss Clare's League quarter-final with Tipperary. CLARE HAVE SUFFERED a fresh injury blow ahead of their Allianz Hurling League quarter-final against Tipperary on Sunday week. 2013 All-Ireland winner David McInerney, who was outstanding at centre back in the Banner County’s victory over Limerick last weekend that clinched promotion, is facing up to a month on the sidelines. The Tulla defender has been advised by medics to rest a back injury, a move that is aimed at preventing any further problems before the summer. McInerney looks set to be sidelined for three-four weeks and his absence will rob Clare of one of their main defensive fulcrum for the visit of Tipp to Cusack Park. If Clare progress, McInerney could also miss out on the concluding stages of their League campaign as manager Davy Fitzgerald will be unwilling to take any risks on the player’s long-term fitness. Fitzgerald is also planning without Shane Golden, Jack Browne, Seadhna Morey, Tony Kelly and cruciate knee ligament victim Pat Donnellan for the Tipp game. All of those players are injured and Colin Ryan won’t feature either as he is currently on honeymoon and won’t return to Ireland until the day before the game. 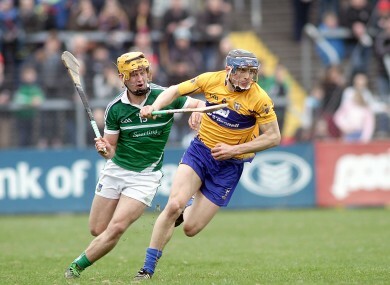 Email “Setback for Clare as key defender set to miss League quarter-final against Tipperary”. Feedback on “Setback for Clare as key defender set to miss League quarter-final against Tipperary”.